Discussion in 'WWII Obituaries' started by Biak, Feb 12, 2011. "The Dieppe Canadian War Cemetery is located approximately five kilometres south of Dieppe, in the town of Hautôt-sur-Mer. The hillside cemetery is unique in that its headstones have been placed back to back in long double rows. The Germans buried these war dead, the same way they buried their own. After they liberated the region, the Allies chose not to disturb the graves. Today, the cemetery is maintained by the Commonwealth War Graves Commission. Of the 944 members of the British and Allied Armed Forces buried at Dieppe, 707 are Canadian, most victims of the Raid on Dieppe. Some of the captured, wounded raiders died in hospital in Rouen, 58 kilometres away, and 37 are buried in that city. Casualties of the raid who later died in Britain are buried mainly in Brookwood Military Cemetery in Surrey, England. The cemetery also contains the remains of one woman, Mary Janet Climpson, a British Salvation Army, Auxiliary Service Officer, who was killed two years earlier in May 1940. Canadians "missing in action" in the Dieppe operation are commemorated on two memorials in England: members of the Army on the Brookwood Memorial and members of the RCAF on the Runnymede Memorial." Service Number: L/13509 Force: Army Unit: South Saskatchewan Regiment, R.C.I.C. son of William George Leonard and Daisy Maud Woodland, of Widley, Hampshire, England. "All credit for the following info goes to Steve Pegge and the rafcommands web site. He [Sgt Henry George Neville] was killed after his Blenhiem (V5380/D) was shotdown during an early morning mission dropping 100lb smoke bombs. PO C.L. Woodland and Sgt A.S, Boyd died with him. The Blenhiem was one of six 13 Squadron aircraft taking part and it appears the aircraft was hit by flak from a coastal battery near Berneval (they claimed a 'Hampden' at the same time), but there is also a chance that the aircraft was hit by 'friendly fire' from the Allied naval force. Four more of the squadrons aircraft suffered varying degrees of AAA damage. " Unit: South Saskatchewan Regiment, R.C.I.C. Sergeant (W.Op./Air Gnr.) 218 Sqdn. Son of Reginald Stanley Collins and Dorothy Mabel Collins, of Kettering, Northamptonshire, England. Son of Donald and Kathleen Ross, of Inverness, Scotland. "A friend of mines brother was lost on operations on 12th March 1943, whilst flying as a Flight Engineer with 218 Squadron. He was Sergeant Reg Heath from Hutton, Somerset. F/Sgt C.J. CAMPBELL - NZ403757. Sources: Chorley Vol.4 page 73 and 'For Your Tomorrow' (Martyn) Vol.2 page 72." "...Grant joined the Royal Canadian Air Force in September 1940 and within a year, landed in Odiham, England, to join 400 Squadron, an Army Co-operation unit at the time. "Bitsy" Grant, as he was nicknamed due to his short build, flew photo-reconnaissance patrols on Lysander and Tomahawks until 1942 when the unit received its first Mustangs. In the cockpit of the Mustang, Grant finally found a machine that was a match to his fighting spirit. By early 1943, he and his team-mate had set a new record by destroying and damaging twelve locomotives in northern France. The famous "train-busters" were hard at work and Bitsy Grant was leading the pack, destroying some 30 locomotives over the period of a few months. Flight Lieutenant Grant was also credited with the first kill for 400 Squadron when he shot down a Dornier 217 in the Paris area on April 13, 1943. He would be credited with one more aircraft destroyed and a probable, but train-busting was really his speciality. For his "fine fighting spirit and determination", he was awarded the Distinguished Flying Cross. Tragically, on September 28, 1943, Grant's career came to an abrupt end when his aircraft was struck by flak during a strike in the area of Ault, in northern France. He died in the crash and his remains were later interred at the Canadian War Cemetery in Dieppe." On a recent visit to Holland in May this year found this newly renamed memorial at Grave Bridge. The "John S. Thompson Bridge" memorial was unveiled on September 17 2004 by his wife Mrs Phyllis Thompson. Thanks for posting those photos, Biak. As wonderfully and moving as it is to see monuments to the fallen in places I will likely never be able to visit, it is a good reminder for us to not take for granted the monuments and memorials that are right in our own back yard, so to speak. Yea. Powerful stuff. If I ever have some disposable money- I know what I'd do. That would explain it. Thanks. I was watching at 10:30am USA Central time so it would be around 4 or 5 PM there I think. You're right John, Just walking through the smaller cemeteries and finding a few headstones of Veterans is moving enough, I can't comprehend standing amongst so many. I was fortunate enough to be able to pay my respects to my Grand Uncle Paul Glasgo, Assistant 3rd Squad Leader, Company E, 3rd Platoon, 145th Infantry Regiment, 37th Infantry Division. The Ohio Division. New Georgia 7 Jul 43 - 5 Aug 43 Munda Airfield and Barley Field attached to the 43rd Infantry Division; reassigned 22 Jul 43 to the 37th I.D. Bougainville, Solomon Islands 5 Nov 43-12 Jan 44. The view from Paul's grave. Your Grand Uncle's wife's maiden name is now my married daughters last name ! small world indeed. 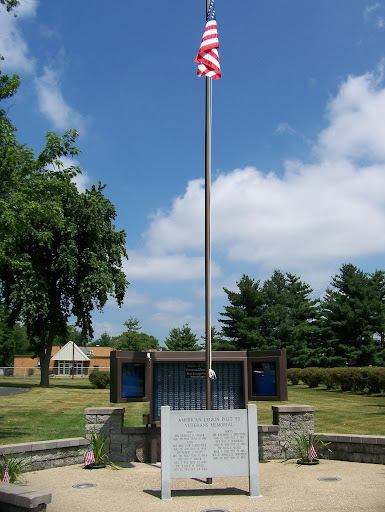 Nashville, Ohio - War Memorial. This sentry stands watch over veterans going as far back as 1863 (the oldest I found so far). The Medallions are placed in front of the granite pedestal. They are awe inspiring to me. Glad to hear that. The Blanchard's are a wonderful family from Untervelier, Switzerland. They settled in Alscace Lorraine for 20-25 years before moving on to Pennsylvania (about 1790) and finally Holmes Co., Ohio. God Bless the Men and Women of our Armed Forces throughout our history. Thanks for posting the photos of the war memorials, Rick. And I was especially pleased to see that you had made the trip to your grand uncle's grave. What a beautiful view of the countryside. Thanks, Thomas. It was a great trip. I received another letter from DSC winner James Underwood. I'll scan them for you in a week or so. Secretary Bennett asked me to send this media advisory out to our project supporters! We hope you can attend! More events to be planned over the coming months during the restoration phase. Arizona Secretary of State Ken Bennett will host a special ceremony at 11:00 am on Friday, April 20, 2012 heralding the arrival of historic gun barrels from the USS Arizona and USS Missouri in Phoenix. The barrels will be incorporated into a complete World War II memorial to be built in Wesley Bolin Memorial Plaza. Joining Secretary Bennett will be legislators, state and local officials, representatives from Burlington Northern Santa Fe, Director Joey Strickland of Arizona Department of Veterans' Services, Phoenix Rotary 100 President Jon Bauman and community partners who have been instrumental in the first phase of the project to transport the artifacts from the east coast to Arizona. The BNSF engine will leave the rail yard traveling southbound along 19th Avenue at approximately 10:30 am. The train should arrive between W. Washington and W. Jefferson at 10:45. (The rail yard is at 19th and W. Fillmore) where it will park and serve as a backdrop for the ceremony which will occur in the parking lot on the east side of the 19th Street, adjacent to the rail line. The engine and railcars carrying the barrels will be decorated with US and Arizona flags. Veterans from the USS Missouri and USS Arizona plan to be in attendance and available for interviews. They will be recognized during the ceremony. For more information on the project visit www.GunsToSaluteTheFallen.com. Clementine, 693FA, TD-Tommy776 and 1 other person like this. Wow, imagine seeing that going down the interstate. I wonder what the Memorial will look like? I won't be there, but what an awesome tribute. I hope someone on this site gets to talk to some of the vets.